this business of keeping in shape is serious: it is difficult to achieve even the most modest goals, but so easy to lose them. one could let go only momentarily, and risk having to start all over again. since i've dumped my gym membership this january, my only source of fitness has been running (i do not consider my mountaineering as a form of fitness; rather i keep fit so i can enjoy my forays into the mountains). i run like most people: out in the streets, usually at night, three times a week as much as possible, at least 5 kilometers each time. this year, i peaked around the time of the globe run for home in march. 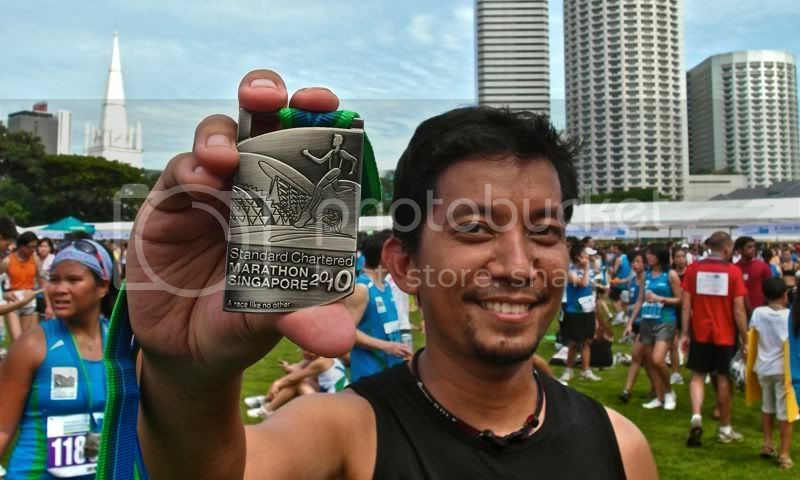 it was a series of skids right after that, and i never managed to gain any relevant kilometrage, resulting in awful results at the 21k events of the nature valley run and most recently, the 2010 standard chartered marathon singapore. i had neither training, focus, nor resolve. even my revised plan of just beating my PR was replaced by my sudden desire to take mundane footage of runners against the singaporean skyline. that sunday morning would have provided me with the perfect conditions for whittling my former time of 2:35:31: the weather was cooperative, and the streets of singapore, even. i had good sleep and no alcohol the previous day (although i did pile on 5 pounds of glorious hawker food). i invested in calf compressions from 2XU, and was prepared to hit the pavement, optimistic despite the odds stacked against me. the race course was new, and i took the MRT to vivo city for the 6:30am gun start. the bridge leading into sentosa was so packed, it took me nearly 8 minutes to actually cross the start line. at first i thought i'd just see how far my legs would take me. 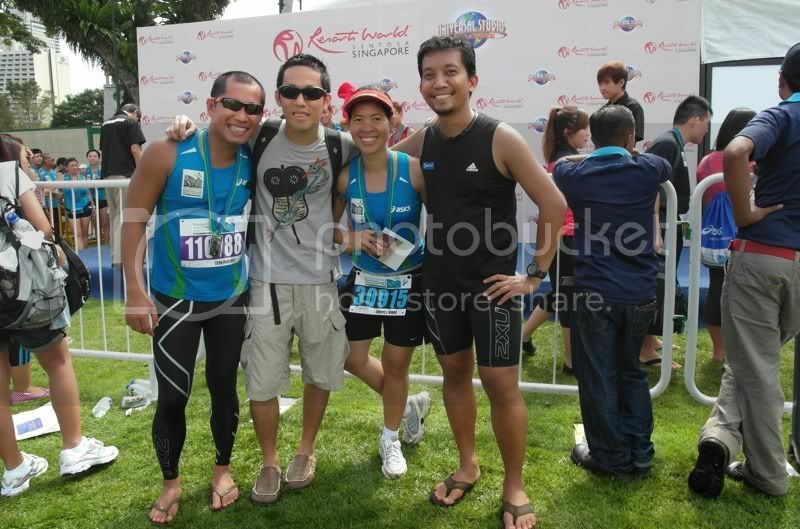 experiencing my first international foot race outside the country two years ago, i heaped praises on the organizers of the SCSM 2008 for the route, the management of traffic, the closure of roads, the festival at the finish line, the souvenir items. it took local races a while to even inch closer to the scale of that event. this time however, i found that they were a bit too overeager to showcase some of singapore's newest attractions that they compromised many of the things that made the race admirable the last time. weaving into sentosa and around universal studios, the race course had serious bottlenecks in many points. with 15,000 runners participating in my category, a route that narrows to just 8 meters across is clearly unacceptable. in fact, at one point, the runners were cramming themselves into the sidewalk that was not even 2 meters wide because the road had flooded from the previous day's rains (yes, it also floods in the first world). it certainly was a huge treat running into universal studios, hugging shrek, giving the penguins high fives, waving my hand at charlie chaplin, and staring back at the muscled guards of the pyramids from the mummy returns, but this was, above everything else, a race where records are meant to be broken, beaten, made. i am contradicting myself a little, but then again, the thousands who had gone ahead of me would probably have similar complaints. and it did not help when runners from all categories, who combined for a staggering 55,000, merged just before the impressive marina bay sands. in some parts, walking was necessary because the crowd was just too thick. there was obvious lack of foresight here. 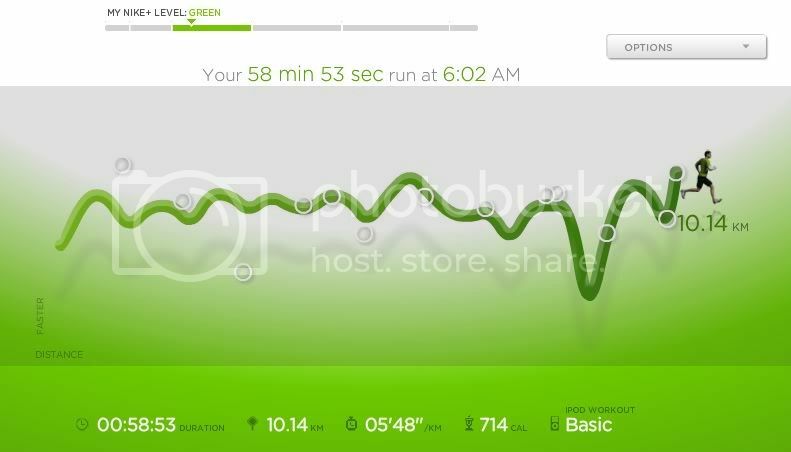 i'm sure there are technologies available to predict the movement of runners and determine how much road space would be required. if that doesn't exist, there's plain common sense. personally, it was a failure from the gun start. i just wanted to put in a good run as much as i can but i was just not in the zone. even my first 10k, which i hoped to do in under an hour, was awful, and i was slow from the very beginning. i didn't experience cramps along the way. i did stop at the 11km mark to take off my calf compressions because i felt they were constricting the blood circulation in my legs. several runners came around to look at me, and some even bothered to ask if i was okay. how sweet! i paused several times during the run to take videos. 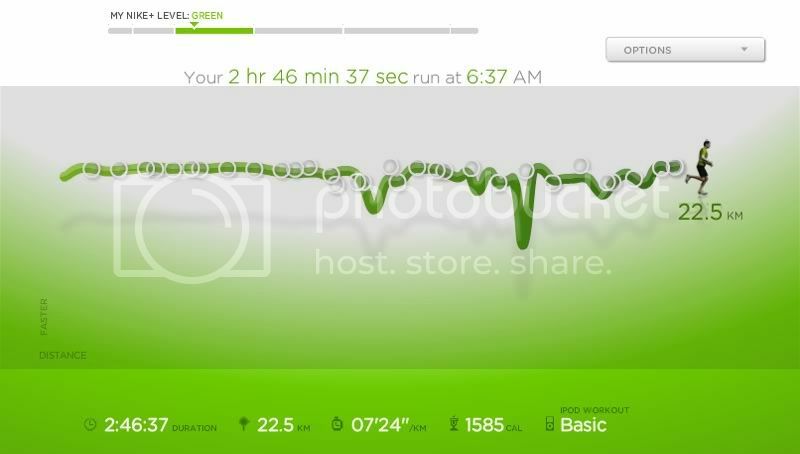 in the graph generated by my nike+, there are very visible dips in my speed because i actually stopped. at one point, i had to line up to get hydration. it was that silly. the lack of training combined with a terrible lack of commitment on my part to yield a time of 2:46:29. this was as long as my nature valley run. embarrassing. immediately after the run, i waited for iton at the padang and i joined his friends from the filipino dragons for lunch at seven one zero seven. it didn't immediately sink in that it meant 7,107: a filipino restaurant in marina square. i wasn't too thrilled to eat filipino food since i'd only been in singapore for 38 hours at the time, but i decided to join them nevertheless. i had the buffet and had lots to eat. if i wonder why i'm not losing a lot of weight despite my frequent running, this is the explanation: i far too often reason to myself that i'd burn the calories anyway. clearly flawed reasoning, and i have a body of evidence to prove it. so i've decided to make some changes next year, and have signed up for 3 foot races already. 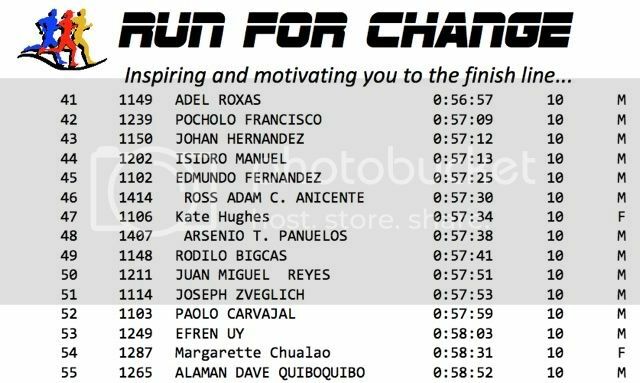 i know that i've panned many locally-organized races for turning runners into cash cows: organizers literally milk running enthusiasts with gimmickry and by wrapping their events with glittering generalizations: "most prestigious running event", "first in the makati CDB", "best international marathon", etc. so it was kind of a relief to take part in a no frills foot race yesterday. we had no photovendo. no finisher's medal. no DJs or celebrities hosting. no warm-ups by trainers from fitness first. no timing chips. no GPS-guided race-course presentation. just good, old-fashioned running from run4change. it was back to basics, really: we just had ample hydration from pocari sweat, strings to prove you've made a certain turn-around, and not much else. a third of the road was blocked just for us, and given the volume of runners who participated, it was more than sufficient. the pre-run program was hosted by two girls who had absolutely no rapport, and started just behind the venice piazza at the mckinley hill. and it was for a good cause. i chose gawad kalinga as the beneficiary of my registration. i was out in front from the start line, and i immediately felt out of place. it was my first time to run around the area since i did not show up for the VSO bahaginan run, and it isn't surprising why they call the area the mckinley hill: it really is hilly. we went down to the korean embassy, out to the grandstand, into bayani road, down to the heritage park, and back. i am quite proud to say that i finished in the top 60, which includes about 8 women. now i just mentioned the race had no timing chip, so how am i able to gauge my ranking? well, to amuse myself, and maybe to distract my legs from the usual pains that accompany me at this distance, i decided to count the persons who finished ahead of me. the first one was about 3km ahead of the pack, already on his way back just as i was about to cross the 5km mark. i counted everyone with a bib running the other direction, and took into account those who overtook me after the turnaround. my exact count was 57 runners (inclusive of 8 women), although at best, i was actually in 55th place (6 women ahead). it was fun to keep my brain alert by paying attention to people around me, and i almost fooled myself until i slowed down to get water after the 8km mark, and again just before hurdling 9km when side stitch knocked on my torso. still, i had a good run, and finished in 58:53. sub-1 hour. still good. could be better. it's good to end my running on a moderately high note this year (can't commit to consistency with the holidays rushing in). at least i have something to look forward to next year. i actually should be getting ready for a 16k (new distance for me) on the 2nd week of january. let's see if 2011 is the year i smash records. oh dear. here we go again with those declarations. i apparently did better than i initially thought. i finished in the upper 28%, 55th out of 195 runners in the category. also, there were only 6 women ahead of me. and my "official time" is even slightly faster.